This is one of my very favorite art projects! I usually do this at the beginning of the school year before I'm ready to have my young students use scissors. Discuss with the students how we as artists can use shapes to create a bear (I bring my teddy bears with me to school). The bear's tummy is the largest part so we start with it. Tear a rectangle from the brown craft paper. Get rid of all smooth edges so that we will all have "furry and fuzzy" bears. Tear off the corners to make the rectangle into an oval. Glue the tummy to the center of the manila paper (or construction paper). Make a smaller oval for the head, two half circles for ears, and four rectangles for arms and legs. It is important for the teacher to demonstrate how the students can not make a mistake by tearing the paper--smaller pieces can be glued together to make an arm, leg, etc. Once the bear's body has been glued on, encourage the students to give the bear an expression on his/her face, a vest, a dress, a bow tie, etc. with crayons. Students may also make a background on the manila paper. Add other toy shapes with scrap construction paper. Open this lesson up to ALL kinds of fuzzy animals. Let the student CHOOSE what kind of fuzzy animal to make. Have all sorts of colors available. Tear Bears are popular with older students and adults too. Mulberry paper is used instead of construction paper. The ideal paper is very fibrous so it tears easily. Says MJM: I used handmade paper when I made mine. (check out my gallery) I also "cheated" and used a regular Hole Paper Punch to punch out the circles for the eyes first. I used a 2 in. piece for the head and 1 in. for the snout and ears. Then I wet the edges and tore them off with a set of tweezers (the big kind with the grooves cut in the tips). I tried to do the bodies too but that never worked out too well without a pattern. I just made the heads "peek" over something. Then I just cut out a triangle and round off the edges for the nose. For the mouth, eyebrows and whatnot, I use a ZIG pen. Some chalk for the cheeks and a galaxy marker for the highlights. I found a lady on eBay that made some beautiful tear bears and just tried to make mine look as close to hers as I could. Lots of practice and lots of trial and error. One solution: when doing the lesson, suggest numerous animals that can be created through torn paper collage. Teddy bears, grizzly bears and black/brown bears can be several among many. Pictures of real life animals can be used as reference. The Beary Scrap - They have Tear Bear patterns and a video. 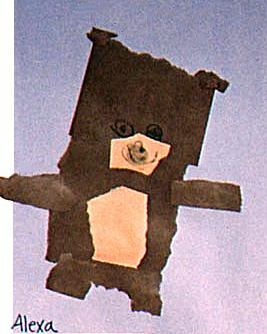 * Torn Paper Bear Collage - At one point, there was a dispute over the trademark of "Tear Bears." Someone had made claims to the name and because this lesson was submitted to The Incredible Art Department in 1996 or 1997, it had been around at least 8 years prior to the claims. The lesson idea can not be trademarked or copyrighted. The wording of this lesson is copyright 1996 or 1997. Internet Archive back-ups of this lesson can be found dating to 1999). Linda White first did this lesson in the 1970's. Because of the one-time dispute over the Tear Bears trademark, you might include a lesson in Trademark law. Each student will come up with a name for their bear (animal) and will submit it to you for trademark. Put the time they submitted it on the slip of paper. Students with same names will have to challenge the person who submitted it first and will have to prove that they came up with the idea first - or simply change the name of their bear to something that has not been chosen. Present a mini lesson about Trademark. Mickey Mouse, for instance, is trademarked and copyrighted. Tear Bear is a trademark owned by Teddy Bear Treasures. Incredible Art Department is home of the original online Tear Bears and is not affiliated with Teddy Bear Treasures.